Today’s coolers have come a long way since the days of our parents. I had the opportunity to use the Orion 45 quart cooler for a couple of months this summer and feel like I gave it a decent workout. Before getting into how it held up to the claims of keeping items cold for seven days, let’s take a look at the awesome features this cooler provides. Starting at the top, there is a very nice and durable standing pad for those that like to sit or stand on their cooler. On each corner there are metal corner protectors that also act as beverage openers, and are accessible for tie downs to keep things secured on the inside. The cam-lever latches work great to keep the top shut during the day and the large O-ring on the inside keeps ice frozen and items colder longer. On each end is another area that you can use to secure your cooler if you are in an area where there are pesky bears or untrustworthy people. Heavy duty hinges in the back provide many entries into the Orion cooler. When it comes to draining, the large drain plug will drain your cooler fast, leaving only a small amount of dampness to wipe dry. What brings all these great features together is the roto-molded body and 2-plus inches of insulation, making this cooler number one in its class. The grizzly proof certification only adds to its already many features. Let’s not forget the bottom where the large footprint rubber pads keep the cooler from sliding around. 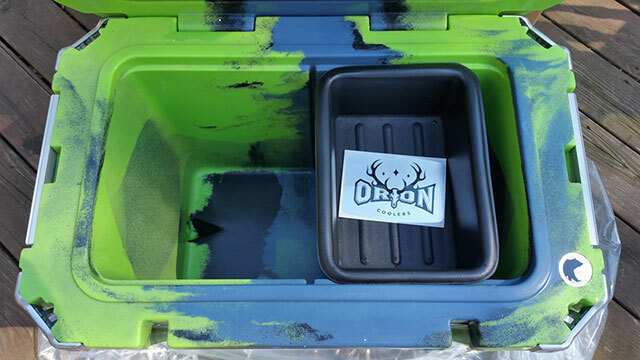 In each Orion cooler is a tray to put items that you want to keep off the ice. In the larger size coolers you can purchase the optional dividers to keep food separated. One thing about roto-molded coolers is they weigh more than your usual cooler and the 45 quart weighs in at 31 pounds when empty. Now add ice, food, beverages and you have some weight, but don’t worry. On each end there is a durable nylon rope with a PVC core handle covered with motorcycle grip material that not only allows you to carry in confidence, but provides comfort to your hands as well. My experience with the cooler began with a seven-day trip. I put ice in the cooler around noon on the first day and proceeded to put water and beer in it, which translates to a lot of opening and closing. The cooler was left in the shade outside on sunny warm days and warm nights. On the fifth day someone asked if we had put ice in the cooler. I advised them we still had ice and the water was very chilled. Not believing me, they went and looked for themselves and was amazed at how cold the water was and the amount of ice still left. By the seventh day the ice was gone but the water still was fairly chilled. This says a lot about this cooler and its quality. Another test was when I had put ice in the cooler and left it shut in the garage for seven days. When I did open it, there was still a small amount of ice in the cooler. With any cooler, we must remember that where it sits, how many times it is opened and if we put frozen items plus ice in determines how long the cooler keeps cold. So when packing your cooler, try to remember these tips. Overall, this cooler shined with all its features and thick walls of insulation, but unless you are prepared, the price may shock you. MSRP for this particular cooler is $450.00. Once you regain yourself, you must remember that you are buying a lifetime cooler, one you will pass down to your children along with great memories. They too will probably pass this cooler down to their children. So, when purchasing a roto-molded cooler, it is not only a purchase, but an investment. For more information, please visit www.orioncoolers.com.